If you have noticed a new extension added to your Internet Explorer, Google Chrome, or Mozilla Firefox and it belongs to Savvy Suggestor, there is no doubt that this adware program is installed on your computer. There is a possibility that you have downloaded and installed this adware yourself; however, it is more likely that it has used some tactic to slither onto your computer without your permission. We do not recommend keeping this program installed because it might act in an annoying way and, with its help, you might even infect your system with malware. The removal of Savvy Suggestor is not a difficult task; however, you should still read through this article if you need some help regarding the removal of this program. 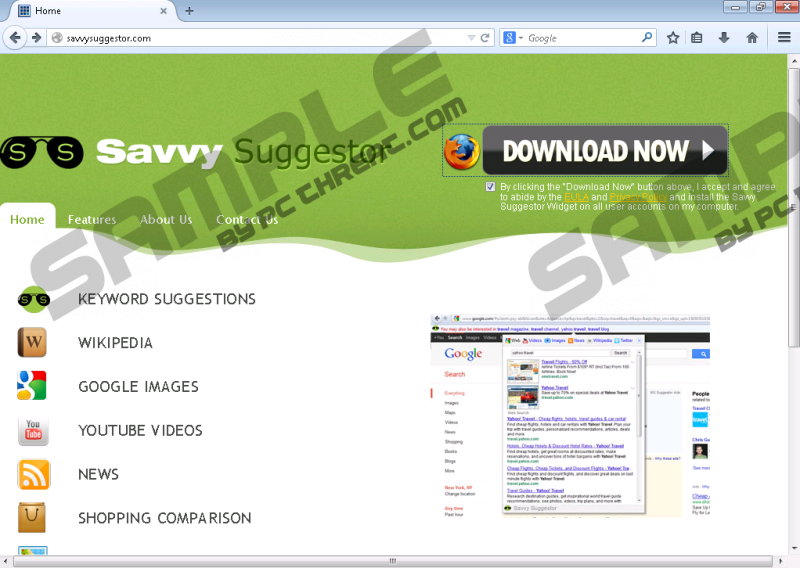 It is not surprising that many computer users install Savvy Suggestor on their systems, because this program promises to search the web by offering related keyword suggestions. Even though it seems to be a very useful program, our security experts have found out that it is not as beneficial as it might seem at first sight. Research has shown that Savvy Suggestor is going to show commercial advertisements. They will appear on your screen no matter which browser you use because Savvy Suggestor is compatible with all the popular browsers. If you already see ads on your screen, make sure that you do not click on them and then quickly delete the adware program. We recommend doing that as quickly as possible because you might allow malware to enter your system if you keep Savvy Suggestor installed. Savvy Suggestor claims that it does not collect any personally identifiable information. This is probably true; however, this adware program definitely records such details as your search queries, the names of the websites you visit, the time you spend on them, and even the content you access. You have to delete Savvy Suggestor from your system if you do not want to reveal what you do on the web to the publisher of this adware and third-party advertisers. It is not difficult to remove Savvy Suggestor manually; however, it is not enough to delete it via Control Panel either. According to our specialists, you will have to remove extensions from your browsers in order to fully delete Savvy Suggestor. Of course, you can also use a trustworthy antimalware tool to do that. You have to acquire SpyHunter or another 100% trustworthy tool and then scan the system. The best thing about antimalware tools is that they protect the system from future threats. Click on the same button in the dialog box once again. Select Reset browser settings and click the Reset button. Quick & tested solution for Savvy Suggestor removal.